A senior military commander told a House panel on Thursday that Iraq's security forces are on track to add another 80,000 personnel by the end of the year, but it's a long way from becoming self-sufficient. Lt. Gen. James Dubik, head of the Multi-National Security Transition Command, said the Iraqi defense minister has stressed to him that the country could not assume responsibility for internal security until as late as 2012. Also, it would be unable to defend its borders until at least 2018. There are "positive signs, indeed, and steps forward, but the truth is that they simply cannot fix, supply, arm or fuel themselves completely enough at this point," Dubik told the House Armed Services Committee. In private discussions, Dubik said the Iraq defense minister - Abdul-Qader al-Obeidi - continually raises the point that the Iraqis need to buy more air and fire support, helicopters and logistics equipment. These purchases will likely take several years, and training Iraqi soldiers and other personnel on the new equipment will take more time after that, he said. Rep. Ike Skelton, the Democratic chairman of the panel, said he is worried that U.S. troops will be worn out in the meantime. "Security in Iraq has improved over the past year, due to the heroic efforts of our troops. ... But the question now is how do we sustain it?" The training and equipping of Iraqi security forces has long been considered the linchpin in the Bush administration's exit strategy in Iraq. But the public and members of Congress, including many Republicans, have said they want to know there's light at the end of the tunnel. "I think most Americans would like to have on their refrigerator a chart they can follow that speaks to when we can get out," Rep. Roscoe Bartlett, R-Md. Dubik responded: "When I talk to my dad about these kinds of things, my advice is to him is put no number on the refrigerator." "Does that mean we'll be there forever?" asked Bartlett. "I don't think people have any stomach for that." Dubik said the U.S. has already begun to reduce the number of brigades and will continue to do so as the Iraqis take over. But the goal must be not to lose ground, "so that the successes that we fought for, we can retain and leave in such a way that the job is complete," he said. A bomber blew himself up inside a Shiite mosque Thursday, killing 10 people, police said - the second deadly suicide attack in two days in violent Diyala province northeast of Baghdad. The bombing took place on the outskirts of the provincial capital, Baqouba, and coincided with preparations for Ashoura, the holiest day in the Shiite Muslim calendar. 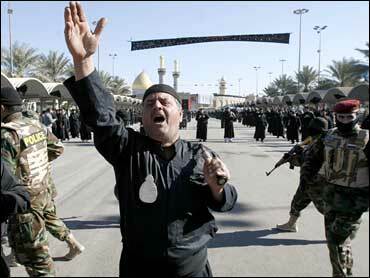 Sunni Arab militants have repeatedly targeted Ashoura processions, with hundreds killed by mortar shelling or car bombings since 2003. On Wednesday, a female suicide bomber struck black-clad worshippers preparing Ashoura, killing at least nine people in an attack that highlighted insurgents' widening array of tactics against a U.S.-led offensive in key areas on Baghdad's doorstep. The Iraqi Oil Ministry has decided to stop cooperating with international oil companies participating in production-sharing contracts with the Kurdish regional administration in northern Iraq, an official said Thursday. The decision is considered a first step toward implementing the ministry's threats to blacklist and exclude these companies from any future deals with Baghdad if they refuse to abandon their oil deals with the self-ruling Kurdish government.